The mintage levels for the Capped Bust Half Eagle spanned an enormous range from less than one thousand pieces to more than a quarter million. While these figures are interesting to study, the mintages by themselves are of limited utility for determining the rarity of a particular issue. Extensive exportation and melting during this time period leads to survival rates which often bear little resemblance to the original production levels. Estimates of pieces known have been used as the primary factor in determining the relative rarity of issues for this series. As an example, in 1815, only 635 half eagles were produced, and of these only fifteen are currently known to exist. The 1822 issue, however, had a mintage of 17,796 coins, but has only three individual specimens confirmed to exist, with no more examples even rumored to be in existence. 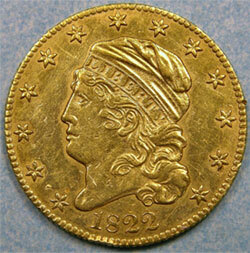 This is also the case for the coins of reduced diameter, that were struck from 1829 to 1834. Mintages varied from 50,141 in 1834 to 193,630 in 1833. Every issue of this series has less than 75 examples known in all grades, making it one of the toughest type coins to acquire in any grade. The table below contains the mintage figures for each issue of the Capped Bust Half Eagle series from 1807 to 1834.